These homeowners had a roof that was about 16 years old and had several signs of visible wear and tear. After meeting with our salesman the homeowners agreed a roof replacement would be the best course of action. 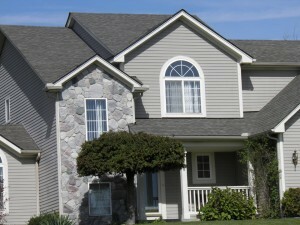 The finished roof looks amazing and the homeowners were thrilled with the process! New, water damage (2ft. x 3ft. area) found in kitchen ceiling following 3-4 days of rain. No pipes or water source above the affected area. With over 15 years of experience providing quality roofing services, Coverall Roofing are the local experts for roof repair and roof replacement in Berkley and nearby. If your home has suffered storm damage, has an old or worn out roof, or has a roof leak, we can help. At Coverall Roofing, we repair all types of roofing problems, including roof leaks, broken and torn shingles, hail damage, wind damage, storm damage, and general wear and tear. Fixing roof problems as soon as you find them ensures that the damage won't become worse and damage the inside of the home or require a full replacement. We can help you determine the best services for your needs and provide a quality solution. Call Coverall Roofing today to get quality roof repair or roof replacement for your home in Berkley. We offer free estimates on all our work!